The Women's Domane is Trek's lightweight endurance road that provide's comfort, speed & fun! 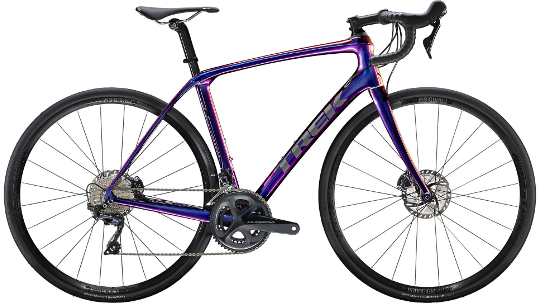 Trek designed the Women's specific Domane to provide you with a bike that isn't afriad to get dirty or take the path less travelled on your route home, featuring a Women's specific geometry and components. 600-Series OCLV carbon-fibre brilliantly blends weight and stiffness together to producde the lightest Domane frame that Trek has ever designed. IsoSpeed technology featured on the Domane helps to take the pinch out of the trail by removing road shatter for an enhanced and higher quality ride. With the ability to take up to a 32c tyre, the Domane provides fantastic versatility for off-road, gravel path or cobbled surfaces. Hydraulic disc brakes help to take the stress out of wet and mucky riding, stopping faster, more effectively and with greater reliability when compared to mechanical or rim-brakes. Finally, Shimano's Ultegra 8020 11-speed groupset ensures crisp, lightweight shifting in every condition, on every road surface. The right bike for you? If you're not afraid to stray from the tarmac in the middle of a road ride, and you expect your bike to hold up to your every adventure whim. You also like the fit and feel of a bike made for women and, like Trek, you believe that women's bikes should have the same exact performance attributes as their main-line counterparts. Trek's lightest 600 Series OCLV Carbon frame with both Front and Adjustable Rear IsoSpeed. It's equipped with a full Shimano 2x11 Ultegra drivetrain, flat mount hydraulic disc brakes, Paradigm Comp Disc Tubeless Ready wheels, wide 700x32 tyres for extra stability over rough surfaces and a carbon Bontrager Pro IsoCore handlebar that reduces vibrations from the road 20% more than a standard carbon bar. Trek's highest-end Domane carbon frame, high-performance parts and touchpoints than can provide a better fit for women from the start. It's light, fast and not afraid to get dirty, but the real value is in the road-smoothing advantage of IsoSpeed and the undeniably cool feature that lets you fine-tune the compliance of your frame.